The folks at "the little brewery" in Shiner, TX (pop. 2,069), are proud of this refreshing, 99-calorie addition to the Spoetzl family of beers. 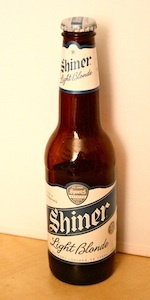 It's brewed with the same handcrafted, small-batch pride you expect from Shiner, delivering a unique light beer. So when you're looking for a smooth, easy-drinking brew, pick up an ice-cold Shiner Light Blonde. It's light done right. PROSIT! S: light grain, a hint of cracker, light floral hops and a hint of fruit. The malt and hop aromas are medium low. T: mild malty sweetness becoming more grainy with light bread crumb notes as it crosses the tongue. There is a faint trace of fruit but overall it has a clean fermentation character. Hop flavor and bitterness are low and the balance is towards the malt. It finishes medium dry. F: body is light and the carbonation is medium high. O: This is a light beer with a smidgen more flavor than the norm for light beer. A- Bright lemony yellow with high carbonation and a large white head when pured into pint glass. S- One note: Light sweet malt scent. T- Malt, very light. Slight hop bitterness and a slightly skunky aftertaste. O- Meh ... Certainly a step down from other Shiner brews. I guess it's probably a step up from the so-called yellow fizzy beers and at least your money goes to a smaller brewery than InBev or Miller-Coors ... Am I grasping at straws? This transparent yellow beverage smelled a bit like hops, I thought. I tasted none, though. It was like lightly beerish flavoured carbonated water. And I don't like carbonated water. I'm an American. I was outside on a hot day, and I still would have preferred a Shiner Bock. Even those are pretty watery, though. Poured from a 12 oz bottle into a pint glass, I got my girlfriend to split it with me, I have pretty low expectations. This pours a pale straw yellow with a small white head which quickly dissipates. The smells are somewhat sweet and light no real hop presence. The feel is very light. Taste is like what I expected very light adjunct.beer, but better than the big three lights.